So, thanks to Avi's awesome course on Emerging Technologies from OLTD, I have fallen into and finally resurfaced from the 3D printing rabbit hole. I just finished the work for "The 3D Printing Revolution," the introduction course on a 3D Printing specialization I am doing via Coursera. I learned a great deal about 3D printing these days, including about materials which are available right now for prototyping and printing, and I must say I am very excited to start prototyping and designing myself. As our final project for this introductory course, we took a look at Shapeways, a place where you can print your ideas as well as join a marketplace much like Etsy. People can have your object printed and sent to them in a wide variety of materials, from plastic to metal and ceramics (no chocolate yet, boo!). 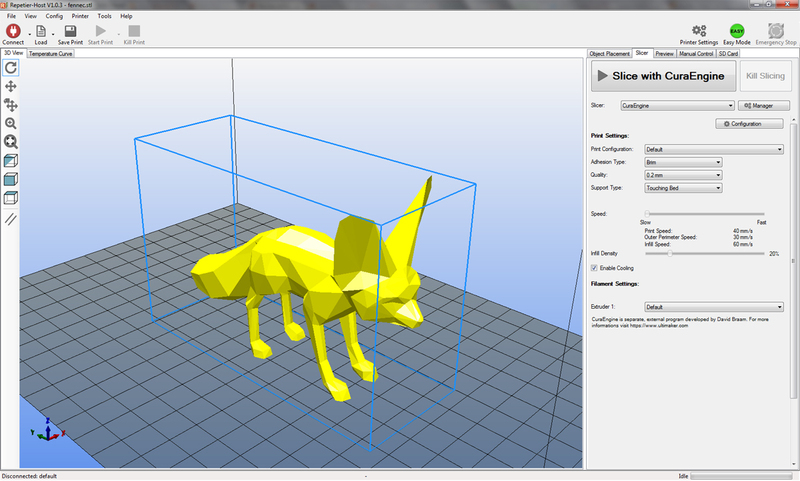 We also looked at Thingiverse, a place where you can download models from other users for free and modify them, then reupload and reprint the model. It's a really fun open-source library of things! If you want a wrench that fits your hand just right, for instance, you can modify it to be bigger, smaller, thicker... it really is an amazing resource. Our final project for the course was to find an object and modify it somehow. I looked for an object which could provide me with the widest possibility of modification, and finally found a box, done by Thingiverse creators themselves. Their editor offered an area, and you can pretty much make a box shaped like anything you can draw on that area. It's not as easy as it seems, and I found it a little glitchy with my pen, but it worked out in the end! My first thought was to make a small treats box for my dog, so I set out to make a bone-shaped box for him; however, after many attempts, I was unable to make a box that looked like a bone... it was very lopsided. So, I went with a candy box shaped like an apple, since I am a teacher and all :) it took me about 20 attempts. Not super perfect, but Thingiverse is not a modelling software! And now, I can print this box if I want to! The process of 3D printing really is revolutionary. I believe we are witnessing the same type of mind shift that happened between Gutenberg's printing press and our desktop printers. Still, printing real objects is not as simple as printing paper, and due to the ease of doing your 3D printing online, it is possible that only people who really enjoy creating things frequently will have one at home. I am pretty sure that at some point, I will have one... I am having some great ideas for artwork involving moving pieces, musical instruments and other gadgets! Sustainability. Low waste. On average a 3d printed product uses 90% less material than an object made using subtractive manufacturing. Self-assembly: We can create complex products that come out of the printer self-assembled. As long as you leave a certain clearance between the pieces, they can come out of the printer all assembled and ready for use. A fuel injection for an airplane which we saw on the course used to have 26 separate components which had to be injection molded and assembled; now, it comes out of the printer ready for use! Digitization: 3D printing creates products out of digital files. This puts an object on the same category as a music file: objects now can be shipped electronically, downloaded and printed locally. You don’t need to spend money with shipping anymore. They can also be easily modified and remixed, just like music. All of this eliminates the financial, temporal and environmental impact of manufacturing. Scope over scale: injection molding became so popular because it decreases the cost the more you print. With a 3d printer, it is just as easy to make 1 object as it is making 100. The setup cost is virtually zero. Now, a small startup can compete with a big corporation, and anyone can start their own manufacturing. And a new business doesn't even need to have their own 3D printer! They can just have the idea and go to a local Maker Space, or to a place like Voodoo manufacturing, for instance. Voodoo manufacturing is a high volume 3D printing provider that has been around for a couple of years, and is able to help people print a couple hundred copies of an item without any initial setup cost. They have a room filled with a couple hundred 3D printers, and can produce a large order in a very short amount of time. While they are the first high volume 3D printer company, I am pretty sure they won't be the last. So, the real revolution comes when you look at small businesses who had a good idea, but no way to compete with large businesses. Traditionally, it took a huge amount of capital to invest on the initial set-up of a new gadget. An injection mold machine makes it cheaper to print in large scale, but the initial set-up cost would be prohibitive for a small company. Big companies can also make tens of thousands of units of a certain gadget, and store these in huge warehouses for later sale. In comes 3D printing, and now the initial setup in order to create an object is virtually gone. A small business can visit a maker place and get help from a guru model maker, create a working model of their idea (even with many parts!) and print only a few units of it. Now, anyone can be a creator and a producer of ideas. For our students, this is an enormous shift in perspective. Instead of buying things they want, they can start making their own things, and make them in a way that is unique and customized to their needs and interests. So, where is this train going, and why does it matter for us? The reason 3D printing is so impactful, in my opinion, is because it has the potential to be so green and to shift manufacturing so completely. Instead of having things produced far away, wastefully, and abusing human resources, companies will be able to produce locally, with minimal waste, and only what they need. That's another amazing thing about 3D printing... it is an on-demand solution for our needs. When I had my (now, dead) publishing house, I opted for on-demand printing for two reasons: one, it eliminated my setup costs. Two, it had the least negative impact of all. The books could be printed on-demand in North America, where I knew workers were well paid and treated well. The wood's origin could be tracked down, so I knew that the wood came from replanted forests and it was very sustainable. I also made sure that a tree was planted for every book sold. I felt pride knowing that my company was not affecting the world negatively... and I am sure that many startups feel the same way about 3D printing. Finding ways to make our goods production more environmentally friendly, and to produce things in a way that it doesn't hurt people anywhere, has to be a top priority. Manufacturing can be more humane, and in fact, it must be. This is where we can make an impact as teachers, I think... showing our students that there is another way, and that they can be inventors, creators and entrepreneurs without high cost and without big manufacturing; they can blow the wind onto their own sails without hurting others, or the planet. So, this is the time to jump on the bandwagon, guys! Let's get the kids interested in this type of manufacturing, because when they get out of school, things will be much more advanced. One thing I noticed it, these people who are at the forefront of the 3D printing industry, and changing the face of manufacturing -- most of them were exposed to this while they were in school. Look at the impact we can make!!! I can see a unit completely geared towards making a product and selling it in the school... I can see uses in art, math and social studies... this opens up so many possibilities. Things are not "done cooking " yet, but the cake is starting to smell really good. While 3D printing has been growing at a much slower rate than expected by enthusiasts, this has been shifting in recent years and things are picking up. There has been an explosion of hardware companies making 3D printers; there are now over 300 companies versus only two companies back in 2009. There also have been huge advancements in 3D printable materials, with new ones coming out all the time. Finally, 3D modelling software, which were originally hand-me-downs from subtractive manufacturing days, are now being launched with 3D printing in mind, and that will be a huge help for creators everywhere.